I. Hate. Sherbet. I know that I told you that I was not a big fan of it, but I have changed my mind. I honestly think it is some of the worst stuff on earth. 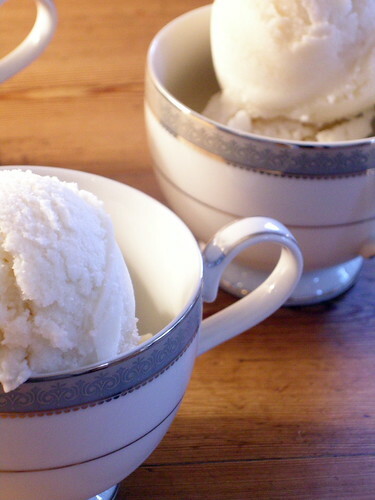 The process of making it does not have the charm of slowly stirring a custard for ice cream or juicing bright, tangy fruits for a sorbet, the texture is disgustingly grainy, and the flavor is almost always barely there. For some reason, two of the three sherbet recipes in Room for Dessert call for whipped egg whites being folded into the sherbet base. I have found no explanation in this book, any other book, or on the internet. If any of you have a clue why a few, very obnoxious, recipes use egg whites and most do not, feel free to let me know. I have come to the conclusion that folding egg whites into a liquid is impossible. I do not recommend trying any recipes that instruct you to do so. Just like the grape pie, this recipe does not require too much effort. It involves a lot of sitting around and waiting, but I certainly was not opposed. Sadly, this was not my most successful dessert day. Nobody liked this either, so I will have to find someone to consume it, as I do not like to waste food. I really do blame it on the fact that it is a sherbet. I am almost positive that, had this been coconut ice cream, I would have had people banging down my door asking for a scoop. Warm milk and sugar. 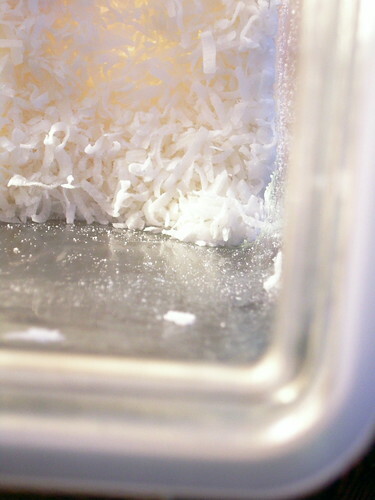 Add vanilla bean, salt, and toasted coconut. Cover and steep for 1 hour. Pour mixture into a strainer set over a bowl. Remove vanilla bean. 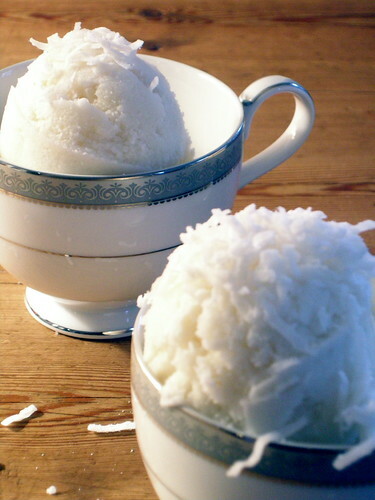 Squeeze coconut to extract all the flavor and discard it. Chill strained mixture until ready to freeze. Before freezing, whip egg whites until they stand in soft peaks and fold into milk mixture. Freeze in an ice cream maker. I believe the whipped egg whites allow more air to be incorporated in the churning/freezing process, have attempted to find further explanation and have also found none. 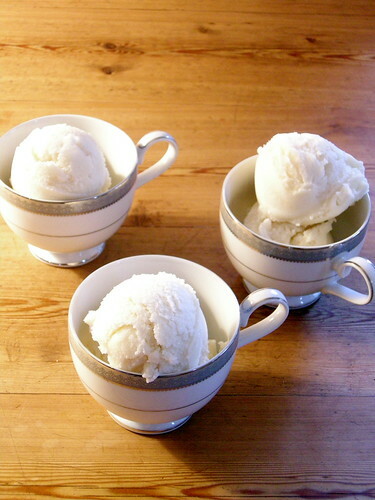 My recipe calls for beating the ice crystals out of the sorbet/sherbet halfway through the freezing process, and adding the whipped egg whites at that time, to lighten the overall texture.